Habit: Perennial herb, densely cespitose. Leaf: sheath open 3/4 length to near base; ligule 0.5--10 mm, truncate to acuminate, sometimes scabrous; blade generally 0.5--3 mm wide, soft to firm, flat to folded or inrolled. Inflorescence: 2--25 cm, often +- 1-sided, generally linear to lanceolate, generally dense; branches generally appressed to ascending (generally spreading only in flower), +- scabrous. 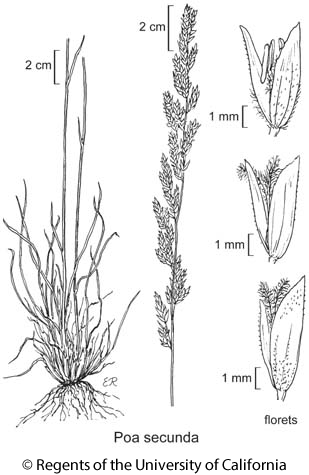 Spikelet: +- cylindric or little compressed; upper internodes generally > 1.2 mm; callus glabrous or with a ring of short hairs; lemma 3.5--5 mm, weakly keeled to rounded across lower back, glabrous to +- evenly short-hairy across body (rarely soft-hairy only on veins), smooth to scabrous. Flower: anthers 1.5--3 mm. Chromosomes: 2n=42--106 (mostly high polyploids). Note: Many ecological forms; subspecies tend to intergrade. Citation for this treatment: Robert J. Soreng 2012, Poa secunda, in Jepson Flora Project (eds.) Jepson eFlora, http://ucjeps.berkeley.edu/eflora/eflora_display.php?tid=38882, accessed on April 22, 2019.